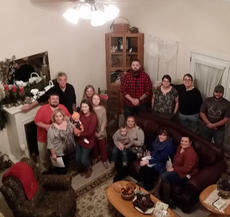 It was a different Thanksgiving for my side of the family as my grandpa Caudill, my mom’s dad, has had several medical events happen after he fell on Wednesday, November 22. He cracked his left shoulder in several places and completely fractured his left arm. He is very weak and is having a hard time getting around as he is very unstable. It has been a hard weekend for me as I stayed home sick last Friday afternoon and all day last Saturday. We are on the go a lot and it was actually weird to be at home all day on Saturday. Although it was weird to me, our Shih Tzu dog, Charlie, loved having one of us home with her all day. 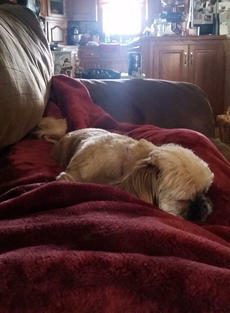 I laid on the couch most of the day on Saturday watching football while Charlie laid on my stomach and slept. Last week was a stressful week, so I went to the Abraham Lincoln Birthplace National Historic Park last Wednesday on my lunch break to relax and unwind. It was nice and I love going there when I can. However, when I went to start my car and go back to work, it wouldn’t start. I just sat there for a few minutes before I even tried to call someone for help, just hoping that a miracle would happen and it would start, but no miracles for me. Last week I got a parking ticket. This drives me crazy, not because I don’t agree with the law—I do—but it’s impossible to follow a law you don’t know. Back up for a second, here’s what happened. We had visitors at our house and the driveway was full, so I parked our car over on a nice, quiet side street in our subdivision. Back where I’m from, this would be a perfect parking spot. So how did that piece of paper end up on my windshield? Winter squash come in many shapes, sizes and colors. They are packed with antioxidants and vitamins. They don’t have any fats and can be prepared sweet or savory. The different varieties of winter squash may be substituted for each other in many recipes. Acorn squash are small, round and shaped like an acorn. They are a great all-around squash. They have a moist, sweet, tender flesh. Acorn squash are great for baking, roasting, steaming and sautéing. There’s something you may not know about me. Most people eat until they feel satisfied or full, and this is why portion control can be very hard to conquer for weight loss. To lose weight without chronic hunger, you need to choose foods that will make you fill full without being very high in calories. This is also referred to as choosing foods with low calorie density. How many of you, while your children were young, had a short bedtime story to help the kiddos wind down at the end of the day? If you were fortunate, it worked well enough to cause your children to develop an appreciation for reading. Foods in the freezer, is it safe to eat? With frozen foods, sometimes it’s more a question of quality than safety. Food and Health Communications reminds us, when it comes to freezer burn, the problem is more of a quality issue. While safe to eat, the quality of freezer burned food may be poor. The safety of food in a freezer is always based on if the freezer has been kept at zero degrees or below. If there has been a power outage and/or the food has reached a temperature over 40 degrees at any time while in the freezer, the safety of the food may be in question.